Make a double batch and freeze the other! 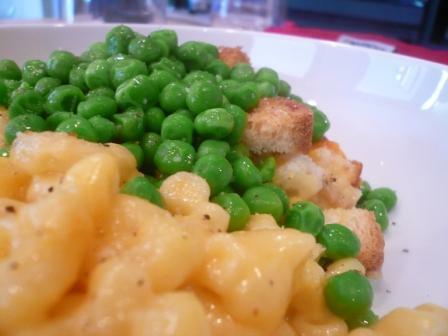 Serve with peas or other veggie! 1. Boil pasta according to package directions, side aside. 2. Melt butter in a large enameled cast iron pot over medium-low heat. Once melted, and flour and whisk well. 3. Slowly add milk and cook, stirring frequently with the whisk, until thickened and smooth – you will see mixture start to bubble. Raise heat to medium if necessary. This will take about 4 – 5 minutes. 4. Reduce temperature to low, add Salt, pepper and nutmeg and stir well. 5. Add 5 1/2 cups of cheese and mix until melted. Stir in pasta and mix well. 6. Top with 1/2 cup of cheese and breadcrumbs if using. 7. Bake in the oven at 350 degrees for about 30 – 35 minutes. 8. To make ahead: complete steps 1 through 5, then refrigerate until ready to bake. Put on the bread crumbs and bake for about 40 – 45 minutes.